Many of my friends told me that they like to have soup as quick dinner especially over weekdays. To save time, and loose weight (eye-rolling), some of them cooked instant mushroom soup. How about having Chinese-style mushrooms soup this time? I boiled this soup for dinner especially when I need something light and filling. This helps to clear my body system, in a way. 1 packet of fresh enoki mushroom aka golden needle mushroom (chinese translation: 金针菇) (about 100 gram), cut off the root part. 1) Mix diced chinese shitake mushrooms in minced meat. Season the mixture with Hua Diao wine, sesame oil, salt and pepper. Drizzle cornstarch, and mix well. Shape minced meat into small balls using serving spoon. Set aside. 2) Heat up a pot with sesame oil. Add chopped garlic. Stir fry till golden browned, quickly add in water. Bring the water to boil over high heat. 3) Reduce to medium heat. Put in minced meat balls, Chinese cabbages, fish cakes, mushrooms and ginger. Bring all ingredients to a boil again. Stir in pepper. 4) Reduce heat to low fire, simmer for 10 min. Drizzle some Hua Diao Wine to the soup before heat off. Serve hot. This soup counts about 160kcal per big bowl. 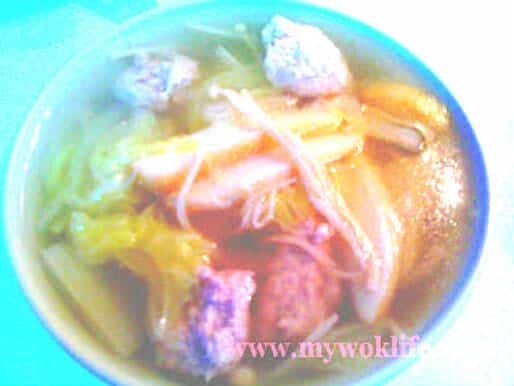 A balance diet where meat, fish(cakes), vegetable and mushrooms found in this soup. If you wish to add carrot (slices) for even more colours of nutrition, expect extra 5 – 10 min boiling time to completely soften the carrots. As for myself, I added some bee hoon aka rice vermicelli into the soup. Yummy! Tips: If you like more aromatic minced meat balls, sauté meat balls, until lightly browned. To weight controller, better skip this step.